All instructional sailing is conducted in Optimists, Lasers, and 420s. These three classes represent the standard for Junior/Youth racing in the United States. Between these three classes of boats we can structure curriculums to suit all ages (7-18), abilities, and sizes. The Optimist is the largest junior racing fleet in the world and the international standard in junior instruction. The boat’s simplicity and stability make it ideal for teaching young beginners while the popularity of the Optimist class makes the boat extremely challenging for pre-teen racers. 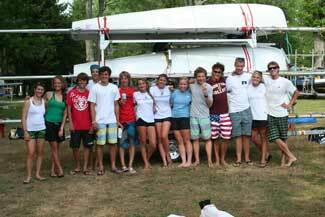 SSA owns a fleet of 16 new Optimists to use for the summer program. Most racers who travel bring privately owned boats for practice and racing. A skipper can race Optimists until December 31 in the year they turn 15. On December 31 of that year, they age out of Optimists and can no longer race the boat. To promote participation across a wide range of skill levels and ages, Optimist racing events are typically divided into fleets. Green fleet is a special fleet for beginners. Green fleeters can be any age up to 15. A green fleet might have skippers who are as young as 6 and as old as 15, but sooner or later they will move into either the red, white, or blue fleet depending on their age. Green fleet typically sails relatively close to shore and on short courses. Sailors may be coached at any time including during a race. Skippers who are 10 or under sail in the white fleet. Skippers who are 11 and 12 sail in the blue fleet. Skippers who are 13, 14, or 15 sail in the red fleet. In all fleets, the determining date is the skipper’s age on the first day of the regatta. Skippers move up to blue fleet on their 11th birthday and red fleet on their 13th birthday. At most regattas, the red, blue, and white fleets all start at the same time and race on the same course. Coaching for the red/white/blue fleets is permissible before and after, but not during, individual races. Coaches can observe the racing from designated areas and provide feedback to the sailors at the completion of the race(s) observed. For more info visit the class website. The Laser is the singlehanded option for sailors who are too big or too old to sail the Optimist. The Laser can be configured with three different sail plans, providing great versatility across a wide range of sizes. Lasers are best suited to sailors 13 years of age or older, over 125 pounds, and focused on racing. All participants in SSA’s Laser Radial instructional program must supply their own boat. Lasers are one of the fastest growing one-design classes in North America and the primary singlehanded boat used in youth sailing events. In 2008, the Laser Radial debuted as the women’s singlehanded event at the Olympics. Because of this, a number of young women are now sailing in the Radial. It is not atypical to see a significant number of female sailors at Laser Radial events, something that was not as prevalent even a couple of years ago. Additional information about the boat is available from the Laser Class Assocation. The club 420 is the most popular and versatile doublehanded junior boat in North America. The 420 is sturdy and safe while providing the challenge of having a spinnaker and trapeze. The boat is best suited for sailors 12-18 years of age and over 100 pounds. 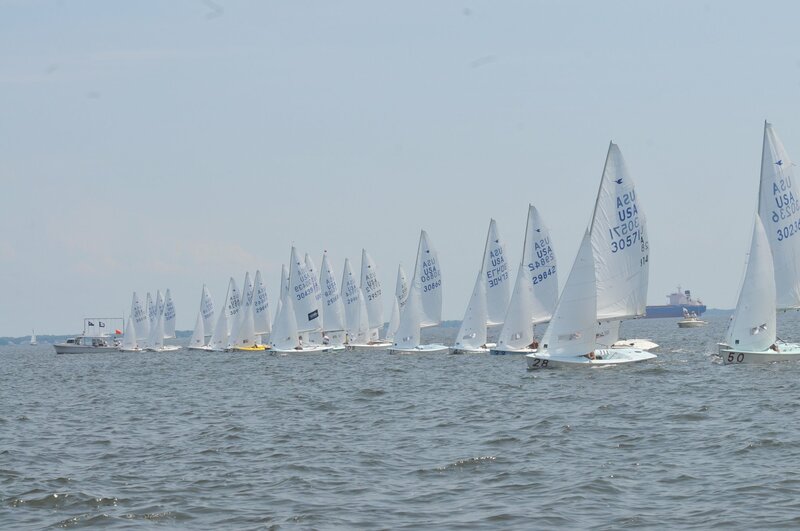 SSA has a fleet of 14 competitive Club 420s for use in the summer program, all of which are less than four years old. 420 skippers participating on the National traveling team are our most experienced 420 sailors, and due to the number of events in which they participate away from SSA, they must supply their own boat. However, because 420s are a doublehanded boat there are plenty of opportunities for those not owning a boat, to crew on a nationally competitive team. Additional information is available from the 420 Class Association. SSA has moved on to the FJ's as they are the boat primarily used in collegiate sailing. They are a two person boat that is more maneuverable than a 420 but does not plane nearly as easily. They are an ideal boat for High School sailing because they do not have the extra equipment for trapeze and spinnaker. These boats shift the focus to boat handling seeing they are more unstable than a c420 when sitting in the water. SSA now owns a fleet of 18 of these boats maximizing participation at events.